CRE Recombinase Gesicles를 이용하여 포유류 세포에 재조합 CRE 단백질을 plasmid나 virus를 이용하지 않고 빠르고 효과적으로 전달 할 수 있다. Gesicles는 exosome-like vesicles형태로 농축된 재조합 CRE 단백질을 목적 세포로 운반한다. 세포내로 도입된 재조합 CRE 단백질에는 nuclear localization signal을 보유하고 있어 세포핵으로 이동하여 LoxP sites의 CRE-mediated recombination가 가능하도록 한다. Flox your cells on demand: CRE recombinase is present when you need it and gone when you don't. Super efficient: CRE Recombinase Gesicles are faster and more efficient than plasmid transfection. Extremely simple protocol: Just apply 10-20 ul of CRE Recombinase Gesicles to your cells. That's it! Limit unintended recombination events: Since there is no coding gene present, there is no risk of sustained CRE recombinase expression in your target cells. What are the Benefits of Gesicle Technology? CRE Recombinase Gesicles are far simpler to use than either plasmid or viral gene delivery. Simply apply 10-20 ul of the gesicles to your target cells; no preparation or pre-treatment is required. CRE Recombinase Gesicles can be used with any cell type, including dividing and non-dividing cells, primary cells, and cell lines. 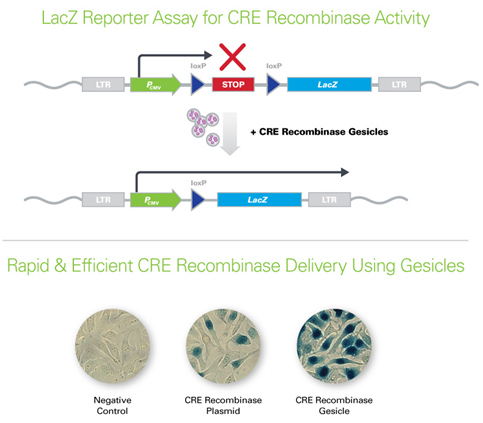 CRE Recombinase Gesicles ensure efficient delivery and high activity of CRE recombinase (see Images and Data tab). When using gesicle delivery there is no delay for transcription/translation: the protein is present and active as soon as you apply the gesicles to your cells. Since there is no coding gene present, there is no risk of sustained CRE recombinase expression in your target cells. CRE recombinase is present when you need it and gone when you don't. 그림 1. 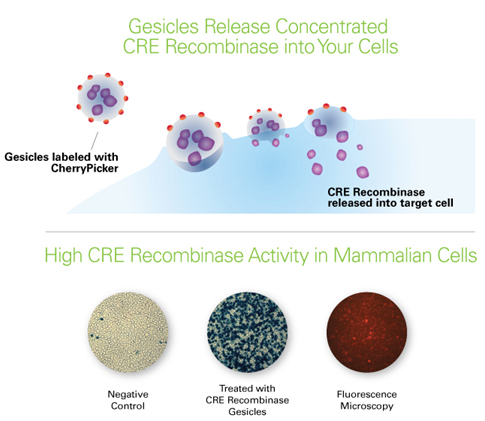 Delivery of CRE recombinase into mammalian cells using gesicles. CRE Recombinase Gesicles are exosome-like vesicles that, when applied to your target cells, fuse with the plasma membrane and discharge CRE recombinase into the cell. CRE recombinase is transported to the nucleus via a nuclear localization signal where it can carry out CRE-mediated recombination between LoxP sites (top panel). Data was generated using a reporter cell line in which the LacZ gene is only expressed when the upstream, lox-flanked stop codon is excised by CRE recombinase (bottom panel, left and center images). CRE Recombinase Gesicles are labeled with the CherryPicker fluorescent protein, so treated target cells can be easily visualized by fluorescent microscopy (bottom panel, right hand image). 그림 2. Rapid and efficient genome modification using CRE Recombinase Gesicles. A cell line harboring an integrated, loxP-conditional LacZ expression cassette (top panel) was either transfected for 6 hr with a plasmid expressing CRE recombinase (bottom panel, middle image) or treated with 20 μl CRE recombinase-containing gesicles for 3 hr (bottom panel, right image). 24 hr after treatment, cells were stained for LacZ expression using the Beta-Galactosidase Staining Kit from Clontech (Cat. No. 631780). The Beta Galactosidase gene is only expressed when the upstream loxP-flanked stop codon is excised by CRE recombinase. Results showed that, compared to plasmid transfection delivery of CRE recombinase, using gesicles resulted in faster and more efficient excision.